Just select the amount of your Gift Certificate below, enter the name of the person receiving it and the PDF voucher will be immediately available for you to download and email to the recipient after you complete the purchase. Please see below for ideas on the services available for various price points. $25 – Say Thank you to those you love by giving them the gift of relaxation at The Waters. Use this gift card towards any of our services or spa shop products. $50 – Begin their relaxation with a Gift Card for $50. May be suggest this Gift Card be used towards a Classic Manicure! 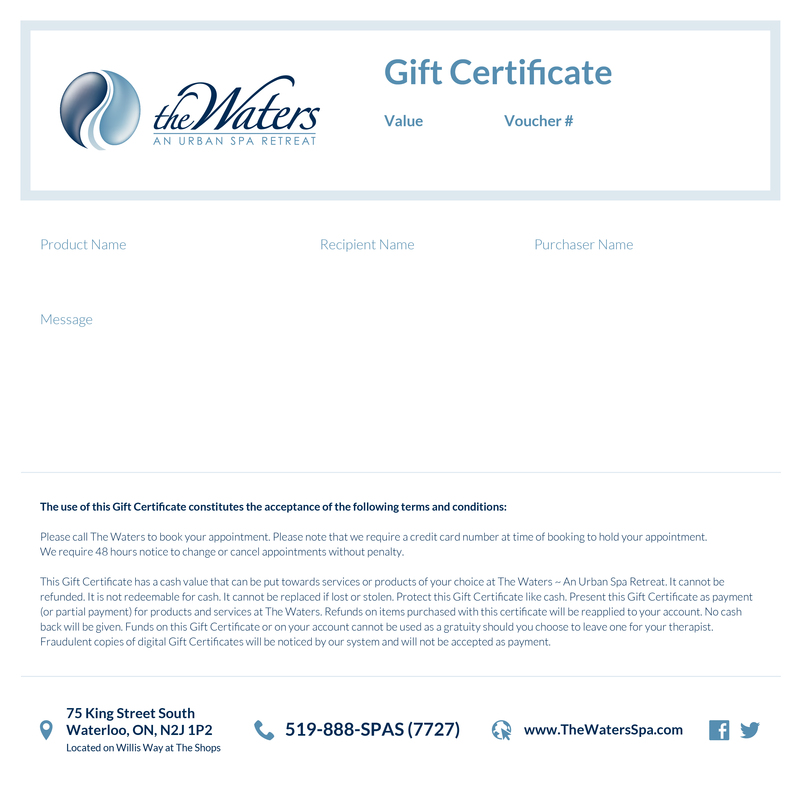 $100 – A $100 Gift Card from The Waters makes a great gift for any guest. May we suggest this Gift Card be used towards a 60-minute Relaxation Massage or a Classic Manicure & Pedicure treatment. $200 – May we suggest this Gift Card be used towards a Worldwide Escape Spa Package or a 90-minute Prestige Facial. This also makes a great gift for a Couples 45-minute Relaxation Massage & Soak. $500 – Treat the one you love with a $500 Gift Card. May we suggest this Gift Card be used towards 3 Ritual Facial treatments – ideal for healthy and bright skin all throughout the year. $2,500 – Give the gift that lasts all year long! May we suggest this Gift Card be used towards an Influence Membership at The Waters ~ An Urban Spa Retreat.